There was a time back in University that Anducci's would be on our regular rotation of eats. Think of it, a bunch of hungry students who may or may not really care about quality - mostly an eye for quantity for a reasonable price. Now, that's not to say Anducci's wasn't any good. In fact, for a time there, it was. But for some reason or another, they changed the formula a few times for the worse. The portions got smaller, food quality went downhill and prices went up. This was a recipe for disaster. In the not-too-distant-past, Anducci's clos ed their Cameron location and a fire finished off their Hastings one (they also previously had locations in Guildford and in the Admiral Pub). 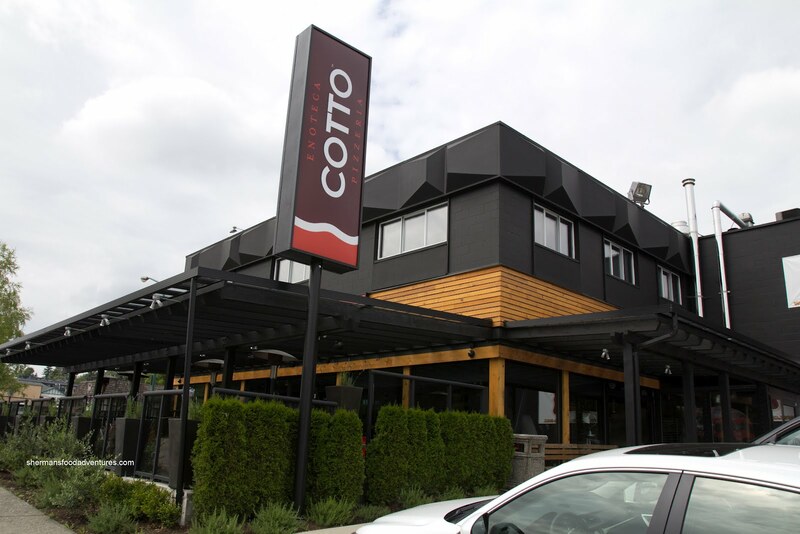 Now, emerging from the ashes and in partnership with Alex Tung, Cotto Enoteca Pizzeria is riding the wave of the Neapolitan-style pizza trend into Burnaby. 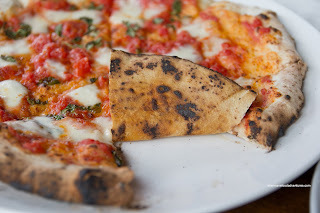 Personally, Neapolitan-style pizza is my favourite form of the pizza. The thin crust, leoparding, flavourful tomato sauce (usually, but not exclusively San Marzano tomatoes), mozzarella di bufala (buffalo mozzarella, but again, not exclusively) and fresh basil are the simple, yet tasty ingredients on the classic Margherita. The pizza should have a crispy outside edge that is a little burnt with the pizza getting progressively softer into the centre. It should be chewy, not soggy though. I took the opportunity to visit Cotto with Marshmallow (who was back for her yearly visit from Taiwan), Elaine (without Costanza, who was choked to miss this meal) and Viv (with the kiddies). This way, we could order lots and see what the menu was about. 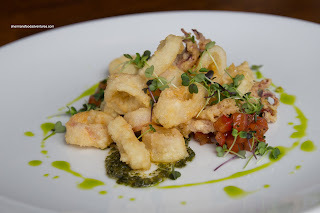 We started with an order of Calamari which was a modest portion, yet for $11.00, it was okay for this class of restaurant. The pieces were very crisp and not greasy. Furthermore, the squid was tender without being mushy. We found the batter to be slightly salty, but it was nicely offset by the tart marinated tomatoes. 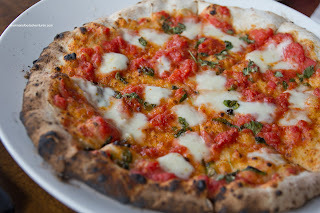 Next came a flurry of pizzas with the classic Pizza Margherita arriving first. The crust had great colour in the form of leoparding (the random burnt spots), hence, there was a nuttiness which combined well with the properly seasoned dough. The centre of the pizza was a bit softer than we would've liked, yet it wasn't soggy. The tomato sauce had great flavour in the form of tartness and enough salt. 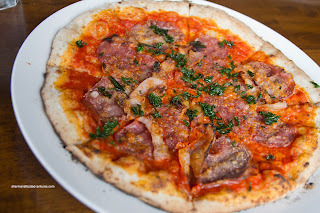 Now with all that flavour from the basic Neapolitan-style pizza, it was only natural that the Pizza Carne (consisting of cured meats) would be on the saltier side. This pizza was actually less soft in the centre, which we enjoyed. It was indeed salty, but I didn't mind it since I love eating meat. 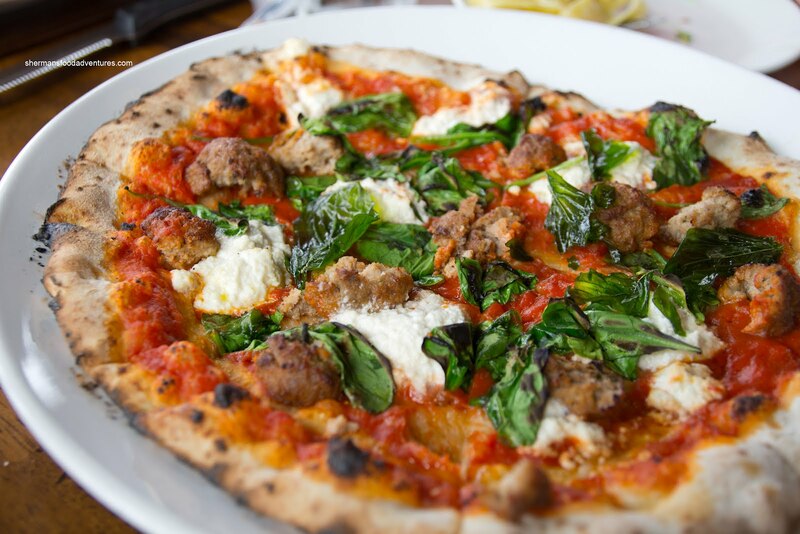 On the topic of meat, we also got the Pizza Polpetti and it was topped with a considerable amount of ingredients. Thus, the pizza was more moist and definitely could not be picked up by hand. On that note, people have to realize that the more toppings means the pizza will be more "wet". We found the meatballs to be moist and not greasy at all. They were flavourful and went well with the tangy tomato sauce. Lastly, we had the Pizza Prosciutto with Arugula which was a pretty standard combination of ingredients. With that in mind, the pizza was still quite good since there was a good balance of meat, sauce, cheese and greens. To get some variety, we also got 2 full orders of pasta which were roughly $20.00 each. Half-sizes are around $11.00. I really liked the Carbonara with a 63 degree egg. When mixed into the pasta, there was just enough "sauce" for both texture and flavour. The pasta was perfectly al dente, it was chewy with a nice resistance and remained that way until the last bite. There was plenty of pork cheek bacon which was cut into thick bits. They were meaty and helped add both aromatics and savouriness. 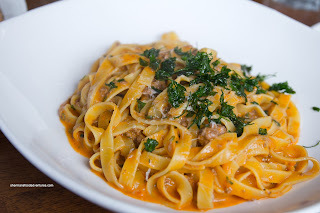 For our second pasta, we had the Tagliatelle Bolognese. 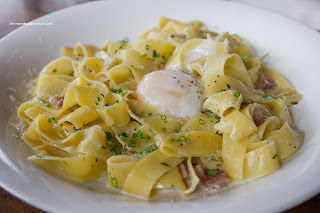 It a slightly smaller portion than the carbonara, probably due to the less wide pasta and the inclusion of more meat. In fact, the bolognese was very meaty indeed with a rich cheesy tomato sauce. At first, we were a bit taken aback at the portion size considering the pastas were $20.00+. However, when you compare the prices to places such as Earl's and Cactus Club, you will quickly see that they are pretty much on par. At the same time, the prices aren't exactly cheap either. 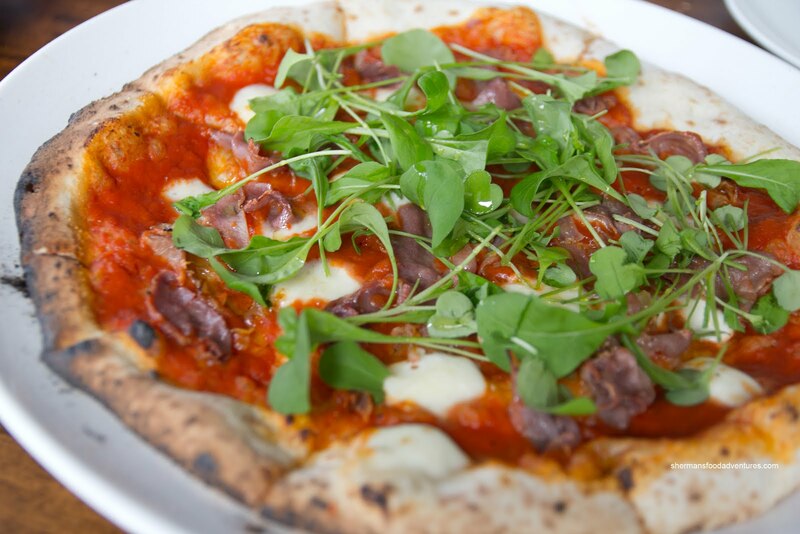 So how does Vancouver's (technically Burnaby) new entry into the Neapolitan pizza craze stack up against the competition? I would say Cotto is above average. I thought the pizza crust was seasoned properly with good leoparding. The middle could've been a touch less soft, yet the ingredients were pretty good. The pastas were not bad, however, I can see some people not liking the portion-to-price ratio. For me, it seems pretty standard for this type of restaurant. The place is definitely an upgrade from the old Anducci's though.